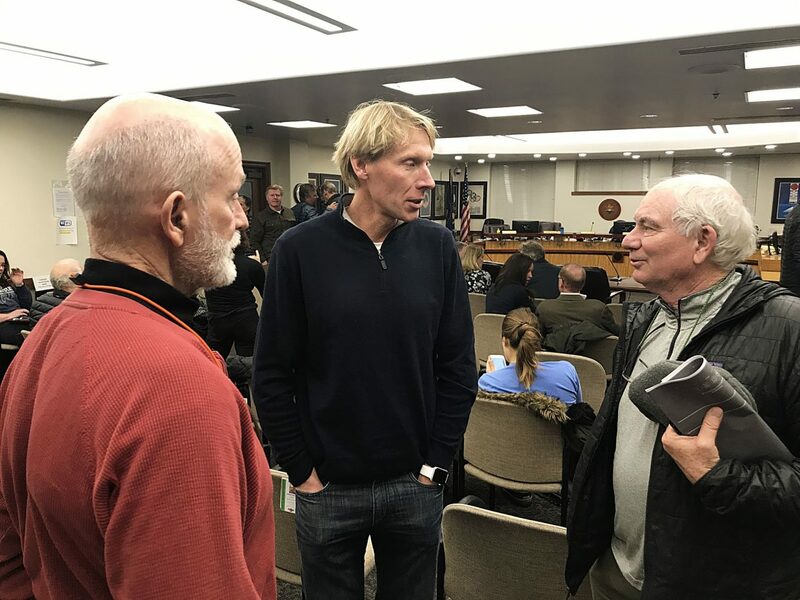 Mayor Andy Beerman, center, chats with Pat Sweeney, left, and Mike Sweeney during a break at a Park City Council meeting on Thursday. The Sweeney family owns a 50 percent stake in the hillside Treasure property. The City Council at the meeting approved a deal to acquire the full Treasure acreage for $64 million. The deal depends on a November ballot measure to raise most of the funds needed to finalize the acquisition. City Hall must forward a $6 million payment to the partnership as a result of the action on Thursday. The sum would be put toward the acquisition if the ballot measure passes in November funding the rest of the deal. The $6 million would be used to reduce Treasure by 10 percent if voters reject the ballot measure. The elected officials in the spring and early summer will hold detailed discussions about the financing of the deal. The ballot measure is expected to be priced at between $50 million and $55 million. 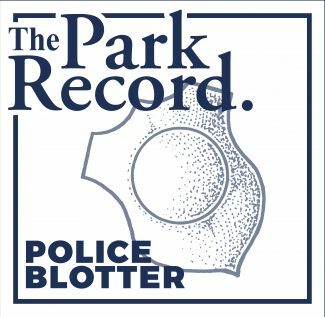 The City Council during the upcoming budget talks will consider alternatives for the remainder, including shifting funds from capital projects like a planned plaza in the Brew Pub lot on Main Street. City Hall estimates a successful $50 million ballot measure would result in a $200 increase in taxes annually on a primary residence valued at $768,000. A vacation home or commercial property with the same value would be charged an additional $364 annually, according to City Hall. A successful $55 million ballot measure would cost the owner of a primary residence with the same value $220 annually while the annual increase would be $399 on a vacation home or commercial property valued at $768,000. The bond is anticipated to be repaid over a 15-year span. The elected officials received testimony in support of the decision to put the acquisition to voters. The mayor, in a departure from typical City Council chambers decorum, allowed applause. He normally prohibits applause in an effort to ensure others in the room who may not agree with the majority are not intimidated. 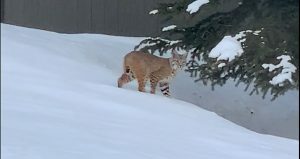 “So much gratitude and appreciation by all parties involved,” said Brian Van Hecke, a leader in the opposition to the Treasure development proposal. 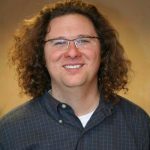 Van Hecke said an acquisition would uphold Park City values like preserving open space and creating a sustainable community. 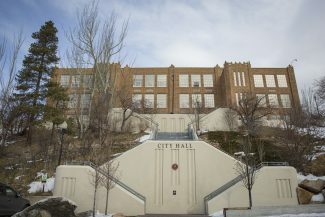 He compared Treasure to Bonanza Flat, the high-altitude land in Wasatch County that City Hall led the efforts to protect for conservation purposes. Van Hecke said a Treasure acquisition would be beneficial decades into the future. He acknowledged, though, the Treasure price tag is a “big ask” of the community. 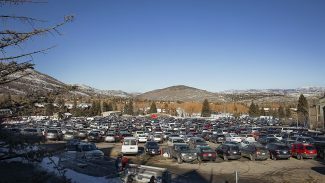 The Treasure ballot measure is almost certain to enliven the election season in Park City. There are no Park City elected offices on the ballot in November, meaning that voters in the city may concentrate on Treasure alongside the county, state and federal contests. It seems likely the backers of the acquisition will rally in an organized fashion in support of the ballot measure’s passage. 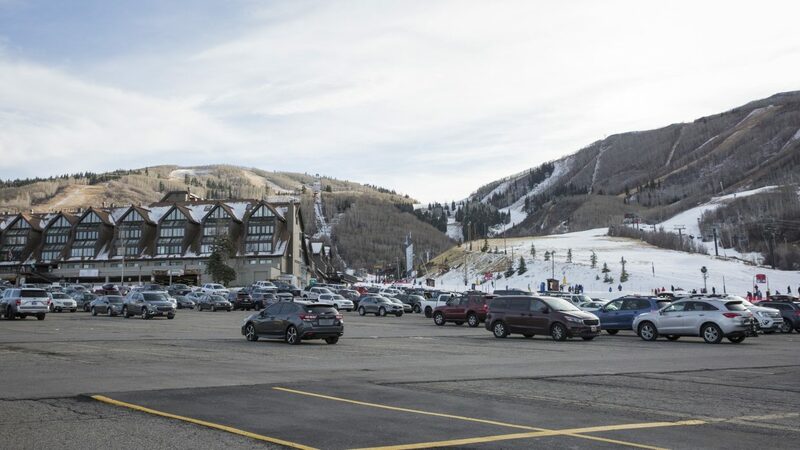 They appear to be crafting arguments centered on what they see as community-wide benefits should the land be acquired, including the preservation of one of Park City’s most visible hillsides. But there have been hints of opposition recently as well as critics concentrate on the tax increase.